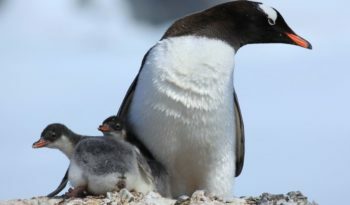 When one thinks of Antarctic wildlife, penguins are often the first animals that come to mind. 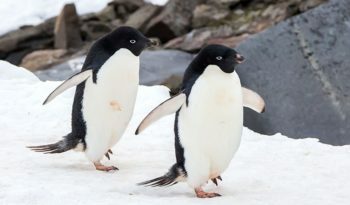 Penguins are birds with black and white feathers and a funny waddle. However, unlike most birds, penguins are unable to fly. Penguins spend as much as 75% of their time underwater, searching for food in the ocean. When they are in the water, they dive and flap their wings as if they are flying under water. The only time penguins are airborne is when they leap out of the water. Penguins will often do this to get a gulp of air before diving back down for fish. 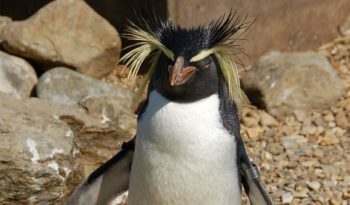 Penguins cannot breathe underwater, though they are able to hold their breath for a long time. Penguins also use their ability to leap out of the water to get from the ocean onto land if there are cliffs or ice flows to deal with. Penguins spend a lot of time dealing with temperature. They are warm blooded, just like people with a normal body temperature of about 100 degrees Fahrenheit. There are 17 species of penguins on our planet. Penguins are shaped like a torpedo. Their body is built for the most efficient swimming with their average speed in the water being about 15 miles per hour. Just like whales, penguins have a layer of fat under their skin called ‘blubber’. Overtop of this they are covered with fluffy ‘down’ feathers and overtop of those they have their outer feathers which overlap to seal in warmth. Penguins rub oil from a gland onto their feathers to help make them waterproof and windproof. Even so, penguins often need help to stay warm. In the photo above you will see penguins huddled shoulder to shoulder with their wings tight against their body keeping each other warm. 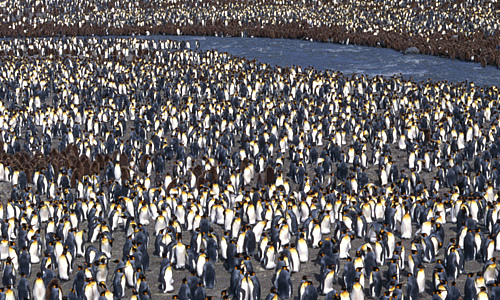 As many as 5,000 penguins will bunch together to warm each other up. Some penguins have the opposite problem. 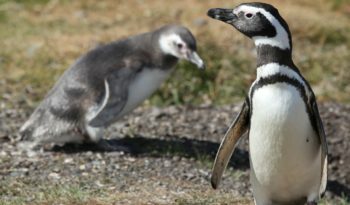 The Galapagos penguins live in such tropical weather that they can become too hot. These penguins spread out their wings and fluff out their feathers to help them keep cool. 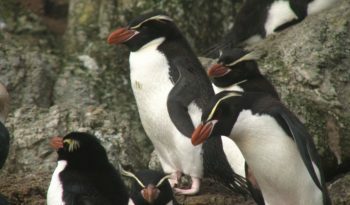 Most penguins feed on krill, fish, squid and other forms of sea life caught while swimming underwater. Penguins spend a quarter of their life on land and three quarters in the oceans. 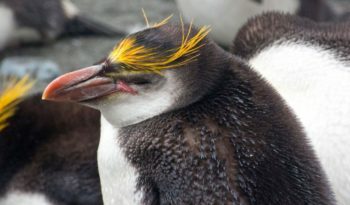 If you look closely at a penguins beak you will notice a hook at the end, perfect for grabbing dinner. Penguins also have backward facing bristles on their tongues that helps slippery seafood from getting away. 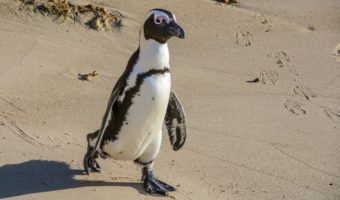 Penguins do not live near freshwater. Instead they drink salt water. Penguins have a special gland in their bodies that takes the salt out of the water they drink and pushes it out of grooves in their bill.